The milk and dairy products category is competitive. How do you plan to stay ahead of the competition? 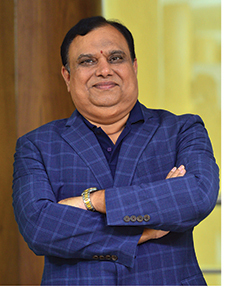 The company is ever-growing by continuing to expand its footprint in India and reaching out to all levels of consumers right from mass to niche. With the sector shifting from unorganised to organised market and from liquid milk/ powder to value-added dairy products, it has given long-term growth opportunity to the organised dairy sector. The company is in the business since last two decades and has become the largest manufacturer and producer of value-added products in dairy industry. Our state-of-the-art infrastructure, international packaging, innovative products, different forms & flavours, 100% cow milk providing better health benefits and unique taste, keep us ahead of the competition. We strengthened our business with the entry into the growing health and nutrition market with our finest brands like Avvatar Whey Protein, Avvatar Isorich, Go Protein Power and Go Colo Power to name a few. The company had planned its expansion in fresh milk category in the Delhi and NCR region. How successful has the company been in achieving it? We set our foot in the north through the acquisition of a new manufacturing facility in the northern region of India. Our manufacturing plant in Sonipat, Haryana, is spread across 5,500 sq mtr on the outskirts of Delhi NCR and provides easy accessibility to target consumer segment. Through this plant we are catering to fresh category products like curd, yoghurt, milk & paneer to the north and north-east region. We also expanded the new manufacturing facility by installing processing units for pouch milk, flavoured milk, pouch buttermilk, cup curd, misthi dahi as well as expand the existing yoghurt facility. We recently launched our premium milk brand Pride of Cows in the national capital. With the aim to provide farm fresh experience to consumers in Delhi, the company will airlift the milk from India’s largest dairy farm, located in Manchar, near Pune. The expansion is a strategic move towards strengthening our offerings in the north region. Tell us about the infrastructure facilities at your dairy plants and chilling centres. How much milk is procured and processed per day? Our commitment to quality and innovation has resulted in huge investments in infrastructure and technology. Our integrated dairy and cow farm at Manchar, is rapidly scaling up to cater to the ever expanding circle of customers in India, who seek all-natural, wholesome and delicious dairy products. The extensive range of our products are processed at this ultra-modern dairy. Our dairy plant is fully automated of international standards and equipped with the best European technology. Right from reception of milk to the finished product, we maintain strict hygiene through the entire manufacturing process. Our plant churns out more than 2 mn litre of milk per day. Cheese Plant, Manchar, Pune: Our cheese plant with a production capacity of 60 MT, it's one of the only two facilities in Asia with UHT technology. The company is providing its UHT treated, superior quality cheese in the domestic and international markets which will be available in a variety of forms such as slices, wedges spreads and a range of exciting flavours under brand name Go. Whey Protein Plant: We are the first dairy company to have whey manufacturing facility in India. We produce whey products - Whey Protein and Advanced Muscle Gainer from our plant, which is completely automated and involves zero human intervention. The uniqueness of Whey Protein is the fact that it is the first India brand, which is based on grass to glass concept. It is fresh, pure, made of 100% cow milk and vegetarian. Further, having our own whey plant at Manchar helps in maintaining the freshness of the product since the entire process from milking of the cows to packaging of whey is completed within 24 hours. How is cold chain transportation taken care of in the distribution of all the products? We are committed to providing premium quality products to our consumers which has resulted in huge investments on the infrastructure and technology front. We are constantly in the process of updating the infrastructure and technology at the company run Bhagyalaxmi Farms in Manchar, Pune, to ensure hygiene and purity of products. For the production of our milk-based products, we collect milk from farmers from 29 collection centres across Maharashtra, which is instantly cooled at bulk milk cooling centres which are located in close proximity to our manufacturing facilities. Our dairy plant is fully automated with modern technology of international standards. Right from milking cows to the finished product, we maintain strict no-human-contact through the entire manufacturing process. Our cheese plant with a production capacity of 60 MT, is one of the only two facilities in Asia with UHT technology. What research and development is taking place in the company? What new products are in the pipeline? Keeping in tune with our brand thought - Ideas for a new day, it is our constant endeavour to create new and innovative products which are tasty, healthy, premium quality and fun. We are constantly driven to seek innovation in milk and milk products through our diverse portfolio of brands with international standard quality. We have a strong R&D research team which is dedicatedly working towards creating and producing new innovations and products in the F&B and nutrition category. We have recently made a foray into the dessert category with the launch of our ready-to-eat gulab jamun and rasgulla and are looking forward to launching some new products in the nutrition category. Brief us about the product Advanced Mass Gainer. Where does this product stand vis-a-vis other players in the mass gainer market? And how do you plan to change people’s opinion about such supplements? Advanced Mass Gainer is a formulation that helps in real weight gains, rich source of energy boosting carbohydrates and proteins that ensure real weight gain among individuals who have difficulty getting their nutrition needs from just food; enriched 21 essential vitamins and minerals ensure your micronutrient needs are fulfilled. This unique formulation delivers highest protein and carbs in combination of 1:3 ratio in the category. It is the only brand in India that is certified by Informed-Sport for zero banned substances. Many brands add steroids and other banned substances to show quick delivery and results. There are overages of creatine to extent of 10g in suggested use vs the specified limit of 3g/day by FSSAI which again can be harmful to your body in longer term. Unlike other brands that source carbs and energy from sucrose, the Advanced Mass Gainer sources carbohydrates from maltodextrin and dextrose. Most international and domestic brands source carbs from sugars as it is the cheapest source. Product is designed specifically keeping Indian consumers food habits in mind and delivers 100% of RDA for vitamins and minerals while other brands have overages of ingredients, which can be harmful in long-term usage. We are educating consumers via our digital campaigns, exhibitions, one- on-one conversation with fitness trainers and owners of retail outlets. BTL activations and sampling is carried out in gyms wherein consumers get to experience the freshest and purest whey.